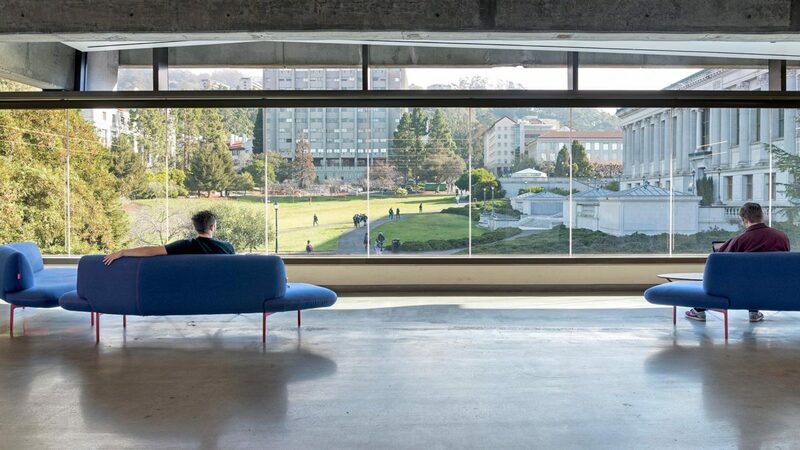 The University of California Berkeley Moffitt Library renovation is a compelling story of transformation. Its reinvention as an active place for critical thought was paramount for the University’s 21st century vision of learning in today’s digital era. Visibility and transparency are essential to reinforce the students’ connection to the community, and vice versa, to cultivate collaboration among the students themselves. 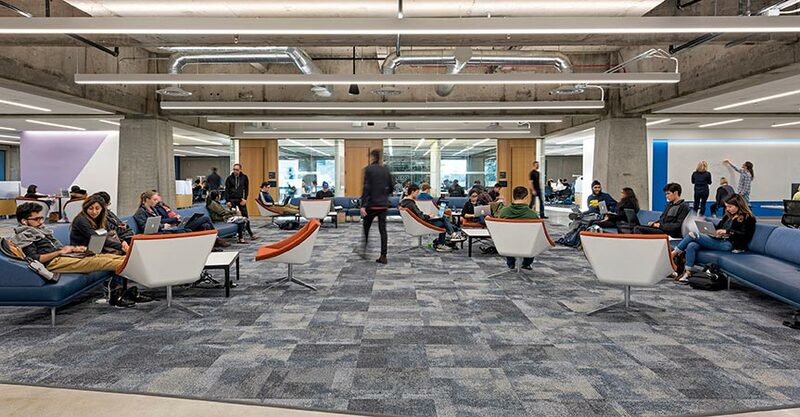 The Gensler team transformed two floors, 36,000 square feet, of Moffitt Library into a distinctive, tech-friendly, 24-hour center for learning. One floor is for collaborative, participatory studying comprised of informal open-seating areas, small huddle rooms and larger meeting rooms for teamwork. The other is a quiet floor for concentration and focus, with study tables, individual pods and carrels, all equipped with technology and access to data and power. As a modern library in the digital era – a research space without books – the access to knowledge and information is plentiful and the role of the librarian is even more profound. The new curtain wall created usable area to fortify the student experience – transforming the inaccessible maintenance balcony into usable program space. Each floor offers in-between spaces so students can discover one that fits their needs of the moment. 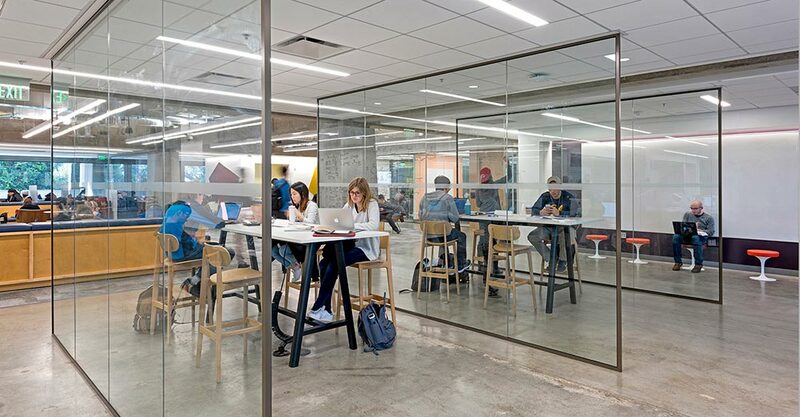 The nooks and crannies near the curtain wall of floor-to-ceiling glass allow students to feel a connection to the outside and address the need for transparency. A key aspect to the overall design was the integration of wellness — an important consideration for students with widely variable daily schedules. With the implementation of food-friendly policies that included family-style tables and open snacking within the library, as well as a designated area for napping, the new Moffitt Library design provides greater support to the individual student. The project also brought a unique challenge as the team implemented new University of California Office of the President Policy to install gender-inclusive restrooms, in addition to offering the traditional restroom experiences. Students expected a new kind of experience that included 24/7 access, the option of sitting or standing at a computer, places to meditate and nap, both solitary and collaborative work spaces, and coffee and food close at hand. 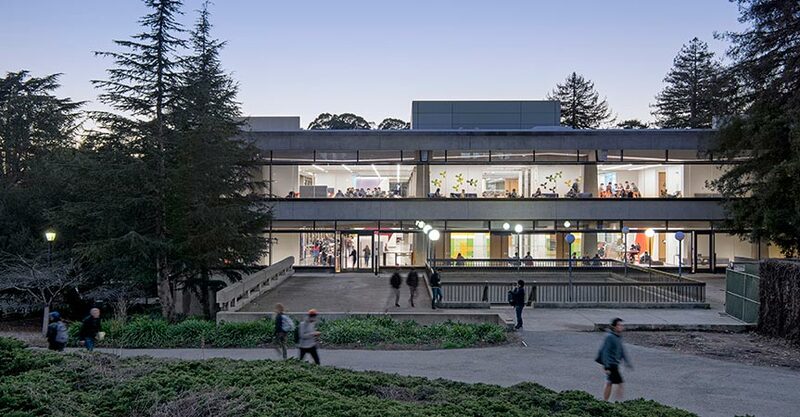 Designing to the technical and end-user requirements proved challenging and exciting with a new library experience emerging to meet the needs of today’s progressive students.